As predicted, rain comes to the Sonoran Desert. I hear a gentle patter on the roof throughout the night. Wind drives it away momentarily, whistling through the palo verde branches. By morning the rain is a steady drizzle and the desert is darkly shaded by a thick cloud blanketing the sky. Bridget’s and Spike’s first trip outside is quick and to the point. Later, around 9 a.m., we venture out again. That’s when I notice the distant mountains. 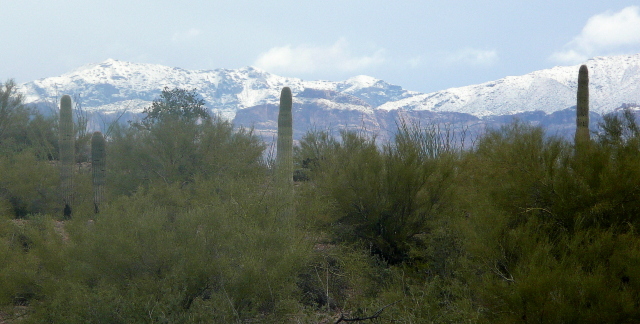 These mountains are northeast of where we are camped at Ajo, Arizona. The first range in that direction are the Batamote Mountains. Beyond them, more directly east, are the Sikort Chuaro Mountains. Further yet are the Sauceda Mountains. Beyond those are the Sand Tank Mountains and then the Maricopas. Yes, I’m having fun with my Arizona Benchmark atlas . . .
Needless to say, I can’t be sure what mountains are in these photos. They make a beautiful contrast to the green desert. I’m convinced the day will stay damp and dreary. However, I’m surprised to see the rain gone by afternoon. The sunshine is back, along with puffy-white cumulus clouds floating across a blue sky. The mud is drying up! I had to put down my dark blue bath towel just inside the door to collect muddy paw prints. I open up my kindle and turn the wireless on. Oh no, no bars. Darn it. My mind is set on reading another Barnaby Skye western by Richard S. Wheeler. Hmm . . . I wonder if the antenna connection to my Verizon air card will fit into the kindle? I find the book in the Amazon kindle store and buy it. As I type this, I’m already at Chapter Twenty-four. I have to end this blog entry now. I have to find out how Quill Woman, the mountain man’s Absaroka wife, adapts to the English customs at Fort Vancouver on the Columbia River. Gee, maybe the crew and I will go there someday. This entry was posted in Simple living and tagged Absaroka, Ajo, antenna, Arizona, Benchmark, desert, dispersed camping, kindle, Sonoran, western, Wilson. Bookmark the permalink. The only thing better would of been seeing it on the cactus. Great pics and a great day in the desert. Nice day to stay in and read. Oh, I don’t mind the snow being on the DISTANT hills. I hope your ankle is feeling better, Pat. Yes, it is much better. I am staying off of it as much as I can. Thanks for asking. Wheelin’ it just posted photos of snow in Tucson!!! YIKES!!! Stay snuggled up and reading! We are watching this same storm approaching us now, all dark in the western sky over the Black Range Mountains and 65mph wind gusts and cold 45 degrees!!! brrrrr! And you’re planning to go to Chloride tomorrow? You may need to postpone and stay inside where it’s warm. yup! not going to Chloride! They leave Thurs for Socorro and Bosque del Apache. Who needs a Kindle when they have an RV Sue? :-), sure love your writing style Sue. Thanks, Bob. Your comment gave me a chuckle. Sue, did you know you can download books to Kindle for free via almost any library in the USA? If you have a library card, log on to whatever website supports it (or them) and give it a whirl. What kind of library card? Libraries are regional. I’d like to do this but I need more information. Sue, I am using Library2Go for my books. I got a library card from Multnomah County (Oregon). It’s fantastic! There are many tens of thousands of books available and more are added all the time. I’d have mentioned it earlier but didn’t think of it ’till this post (sorry). It works anywhere I can access the internet. I can check out up to 5 books at a time and can keep them up to 21 days, but if you check them out for that amount of time and you read all of them in say, ten days, you have to wait until the 21 days are up before you can check out another book, There are also many thousands of books available for download at any time. You can also reserve a book that isn’t available (only a few copies are available for many of the books), and the library will let you know when the book is available for download. I download them to my Adobe Digital Edition that I downloaded and it stores the book until I transfer it to my e-reader (I use a Nook, but the books are available for Kindle also). Good luck! Thank you very much, Bruce for explaining library downloads (and also Tamara for mentioning this)… I don’t have a library card at the moment. I’ll be sure to get one and try it! Wow, what a resource for people on the road or people anywhere . . . . I have three library cards, two of which are for city libraries, one of which is for a county library. All three libraries have their own supported websites, and all three have e-books available for checkout. For Kindle, when you go to check out your e-books on the library’s site, you will be redirected to your Amazon Kindle account, and the download will occur as it normally would if you were purchasing a Kindle book from Amazon. Check out time differs by library, generally two to three weeks. One of my libraries allows me to return the books early, two do not. All three have an e-book limitation of five. All three force me to return them upon the due date (they “magically” disappear), but I can recheck them out again once 24 hours have passed. No late fees, no reservation fees, ever. It’s the best thing since sliced bread..
I’m very interested in this library possibility too but wonder how a full time RVer can get a library card anywhere but where their permanent address is. Hope that’s possible. I know your readers will l let me know. Full timing in a Winnebago Brave current docked at Sebastian Inlet State Park Vero Beach Florida where we are loving being on the Atlantic Beach, no snow in sight. Great to hear from you again, Sherry! Someone recently commented that you can get a library card by mail if your home address is a mail service. I’m going to look up the website for the library that serves the Box Elder region (that’s where Americas Mailbox is and my legal address) and see if I can find out how to go about it. There may be a small charge. Excellent, thorough information, Tamara. Thanks. This Global Warming is making my teeth chatter here in Wikieup Arizona. The mountains are all snowy surrounding our little town. The ground hog should have told us about this unexpected storm. I’ll bet he is nice and warm in his little underground home. The ground hog can have his underground home. I’d rather be in the BLT! Wow, surprise, surprise, the antenna plug fit the Kindle. How nice is that? No, I’m not reading them in sequence. I picked up my first one — I think it was Yellowstone — from a bookseller in Bozeman. He assured me each book in the series can stand alone and it doesn’t matter if you read them out of sequence. I’ve found that true. The last one I read was Rendezvous. Now I’m reading Going Home. Hi Rusty… Too cold to be in the mountains these days. I’m glad Timber has a good winter coat. You bundle up and hunker near the wood stove. Ah, what a nice relaxing day…Ain’t life grand! No matter what the weather, as long as we’re together . . . I see where they are dropping food to the polar bears now. Many think the “global warming” means it’s only getting hotter. Well, it’s complicated but it means we will have totally unexpected and different weather both COLD and HOT. It’s no joke the melting of the ice cap is a sure indication of some bad results worldwide. We didn’t get any snow in Surprise but it has been cool, windy and wet here. Great pics Sue. PS Sue, clam chowder for dinner today….perfect for dreary days. You know me… avoid controversy, so I’ll pass on the subject of global warming. Thanks for the compliment on the photos. I was amazed that my camera could capture such a long distance image. Good for u-no sense in getting upset over things. I’ve decided to avoid stress in my life so no politics, religion or global warming. lol Too many other things to enjoy life. AZ Jim, the Sun is changing from a hydrogen to a helium Sun. This Sun Cycle is known to Indians as the Mayan wrote all about this time we are now in on their pyramids in stone. The Sun reverses polarity about every 12,500 years bombarding the Earth with rays that make the underwater volcanoes go off. This heats the seas and the ice melts. New poles will then be created. We have until the time of the Three Days of Red Sky. Most well-funded libraries (usually urban ones) have websites with their entire catalogs for searching, browsing and reserving. More recently these libraries have added downloadable books for kindle and other devices like i-pads. You probably have to download to your computer and then transfer to your kindle. It may seem like a hassle at first, but I bet you can figure it out :). And its FREE! Hi Alison… I’m definitely looking into this. You know how I love FREE! beautiful photos sue~but i missed seeing the kids! the ones from yesterday will hold me, though. also very nice reference to rusty~i had to go back & re~read his & timber’s story. a little sleet here today! Nice pictures………..the mountains make a beautiful backdrop with the cactus in the foreground. That Wilson antenna is really working out great! Stay warm. Lake effect snow STILL falling here in the Adirondacks. Spring is going to be heavenly for you folks in the north! Beautiful photos of mts w/snow! Good day to stay in & read w/hot chocolate. I love Columbia river! For some reason I prefer the rivers in western USA over the eastern USA rivers…even the ocean and beaches. I do love New England tho…especially during fall when the leaves all turn gold, red, etc. According to weather report in Phoenix paper…should stay rainy until Tuesday. We heard our first thunder today loud and clear…summer’s around the corner. Hi Rita . . .
I’m enchanted with the rivers of the West. It’s like making new friends as they reveal their unique personalities . . . Here are the ones I’ve seen so far: Snake, Madison, Rogue, Wise, Williamson, Virgin (and the North Fork of the Virgin), McKenzie, Colorado, John Day, Siuslaw, Wind, North Platte, Duchesne, and several creeks. Each one is memorable in its own way. There is one eastern river that will always top my list… the Battenkill in upstate NY. I spent the summers of my childhood swimming and tubing it with my cousins. I remember the rapids and rocks and bars of that river as if I were there yesterday, and it’s been over 50 years ago. Well, Jim, I didn’t go that far east. Chamberlain is in the middle of the state off of I-90. Maybe someday . . . I did miss a lot last summer, but I think you’ll agree that there was a LOT that I didn’t miss. What a summer and fall! I have seen the Missouri! Several years ago I saw it at St. Louis. I’d like to see it again further west though. When the River gets to St. Louis it isn’t as beautiful or blue as it is above there. If you ever get near Chamberlain check it out. I love the adventures you take me on and you’ve spent a lot of your time in the area’s I used to see and live in. I love living it again through your eyes. Thanks for your gift of this blog Sue…. PS It was 3 degree in Chamberlain yesterday morning. You’re welcome. I’ve received a lot of thanks since starting this blog of my travels. What a surprise that it would become so appreciated. Your words touched my heart, Jim. I’ll remember what you’ve written as we set out on new adventures, following the sun. Hi Sue, My husband and I met Rusty last week at “the Steps” near Lake Havasu City – what an interesting person. His story is wonderful. You’re talking about someone who is here on this blog (scroll up). Yes, Rusty is an exceptionally talented and kind person and a good friend. Great photos of the snowy mountains! Love my Kindle, also! Don’t know where I would be without it. Have you heard of Bookbub? A great site that sends you three or four book offerings every day. The books range from free to $2.99. I’ve read several of the free ones. The topics are quite varied. I’ve never been in a location that doesn’t get the Whispernet. Sometimes it takes several minutes to hook up but even with no phone service areas, Whispernet has worked. Bookbub… never heard of it. Good to know. I usually can pick up Whispernet, except when surrounded by mountains in far-off places, like here. It wouldn’t work after several tries until I hooked up the antenna… bingo! Libraries typically belong to a network that provides a digital library. We are used to using MyMediaMall from our former library. We are now in the process of getting our new library card from Madison SD. South Dakota has its own digital library. Since we are mail service residents, we have to pay fifteen dollars a year for a library card but it can be done through the mail. I would think your address in Sue Falls would be a similar situation. You will be amazed at the large selection of books. Ours even has a section where books have no due date. These are mostly classics. Thank you, Harrison! I’ll contact the library that serves the Box Elder region (might be Rapid City). 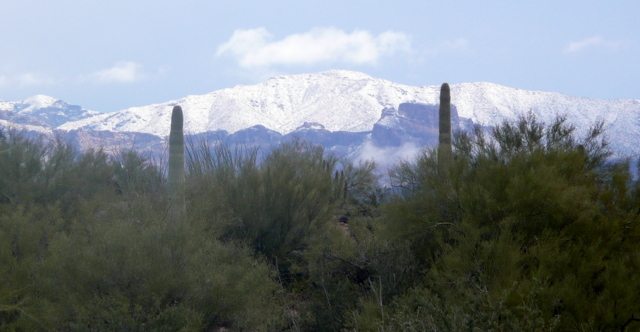 I remember being in AZ, how good that snow looked on the mountains at a distance. We are in blizzard conditions right now in KS and it isn’t looking so good but thanks for the memories. Think I’ll spend my day working on my downsizing to what is going to fit in a small trailer! Yes, when you’re in a blizzard, prepare for warm, sunshiny days at a campsite with your home-on-wheels! About using libraries to download books: I discovered a little (obvious) trick. If you don’t know how long it will take you to read a book, or several books, just turn off wifi on the kindle after you download them. The books will stay there indefinitely until you turn it on again. My reading speed is erratic, depending on what else is going on, and without doing this I’d be stuck with books disappearing when I’ve only half read them many a time. Turning off the wifi takes the worry out of the equation. As to plugging your external antenna into the Kindle, help me to understand this: Neither my Kindle Touch nor the Kindle Paperwhite has an external antenna port. What kind of Kindle do you have? Exactly where did you plug the external antenna wire in? To the mini USB port? Interesting about turning off the wifi. I always turn it off anyway when I’m not using wifi. No, I didn’t use the USB port. I don’t know what you call it. It’s a small, round hole similar to an earphone port. Maybe that’s what it’s for… whatever . . . It gives me signal when the antenna adapter cord is plugged into it. My kindle is an older model (not Fire or Paperwhite). Yes, I confess to doing what Bob has as well, but I wasn’t going to go there publically. Since he went there first, however, I will too! Isn’t that interesting . . . Great job researching it for us, Bob. I’ll stop salivating over the newer kindles and be happy with the one I have. Anyone reading this who owns an older kindle and has an antenna will appreciate that link, I’m sure. Well, if you are happy with the Kindle 2, fine. But the Kindle Paperwhite blows it out of the water. Much crisper text, better fonts, dictionary and Wikipedia available at a touch, and you can read it without needing a good light over your shoulder. At $120, something of a bargain. Seriously, I’ve had both, and if you try the Paperwhite you’ll never go back. As for the external antenna, you can always use the mifi instead. Or am I wrong in thinking you have a WAN setup? You do lose the physical page buttons, though. I’m happy with the kindle I have. I don’t need to find a way to spend $120, although I have to admit that’s quite a deal. Using the mifi? Why would I do that? (not understanding something here, I guess). Why not go directly to the antenna? If the mifi had helped, I wouldn’t have tried the antenna adapter cord. If your mifi is connected to your external antenna, the Kindle should be able to connect with wifi through that as well as directly. It is the same antenna, after all. I thought your trouble was connecting with 3G through the Kindle alone, and you got a better 3G through the antenna connection directly to the Kindle. By the way, be sure to disconnect both wifi and 3g connectivity if you don’t want Amazon to reach down and take away your overdue library books. Forget what I said about a WAN, above. Don’t know why I typed that. I was thinking of a personal wifi hotspot, as through your MIFI. Good luck with the snow. I guess I didn’t think of connecting the kindle to the air card to the antenna, because I usually use that port to connect the air card to the inverter. If I use the air card wirelessly, I have a tendency to ignore it, and then it’s squawking at me for more juice. No snow here, sun’s out again! OOOOHHHH! Come to Fort Vancouver! Come to WA! You will love it. It is a great place to spend the hot summer months (the ocean is clear and fun in WA and the heat minimal). There is nothing like a sunny day in WA. Hi, Barb… Thanks for the invitation. I hope to see the Pacific Ocean someday… WITH NO FOG! Chelan County, Wenatchee, Levenworth……Wonderful area. Spent almost three weeks camped there in the summer. Sittin in the creeks cold water, trout fishing…GREAT!! I can’t wait to get back on the road and to the desert. Interesting phenomenon, Bob. I’ve seen a lot of snow come down in my life, nothing like that! If it turned to ice, you could be seriously hurt! The Inuit probably have a name for it. Yeah, I looked at your blog and you’re a desert rat all right. I hope someday to earn that title. It definitely broke the worlds record of only 15″ flakes, I would imagine that higher up the flakes were much smaller and maybe the wind patterns caused them to collide and join; wish I had grabbed the camera. A desert rat is very fitting for me at this point in my life; however, as a very young child I was called a river rat, I would take off to the river and hop on my raft and head to my Island. There were vegetables growing wild in the area, Walnuts and Almonds; throw out the fishing line and I was in my own little private heaven. As I write this I must admit that I must be somewhat different, I never ran into anyone else out there; all that matters though is that I loved it all and cherish every single memory. When Mom seen my bed was not slept in she always knew where to send the older brothers to find me. I am not sure but there may be a hit country song hidden in all this somewhere; or at least a good mystery novel or two. I’ll be leaving for Joshua Tree National Park the first week of March; 1200 square miles of Boon-docking here I come. Gee, Bob, we have a lot in common. I used to disappear from home from sunrise to dinnertime, exploring the woods and creeks with my dog. That was in the day when girls could do things like that. If my mother’s cooking wasn’t so irresistible, I probably wouldn’t have come back until dark. I, too, “cherish every memory” of those woodland adventures. I even remember the plants! And we’re both boondocking fools! I had a dog also, Tippy, solid black except for a small white spot at the tip of his tail. He too went with me on all my outings. I swear to this day that he understood the English language better than most humans. On my adventures I climbed many a tree, if there was a low enough branch old Tippy would take a running start and join me in the tree. I lost him when he followed a neighborhood drunk across a local bridge and was hit by a car. I still remember the very day Mom came outside and told me of the incident. I buried him under an old Cottonwood tree on the riverbank. Yes, I am a boondocking fool and I can’t wait to convert the motorhome into a four wheeler so I can go deeper off road. I would love to go so deep that I could leave the motorhome and travel on foot for weeks at a time. Yes, I believe that I am a crazy, but at least I know. That’s been me saving grace! Hi Sue, I notice you use quilts rather than blankets or down comforters. Do the quilts really keep you warmer or are they your preference because of your furkids – quilts are easier to keep clean? BTW – weather reports show more snow coming your way. Stay warm!! Why quilts? They don’t wrinkle up like sheets and they stay put. Also they serve as a cover for my sitting area during the day. I would have to put sheets away somewhere and pull something else out. Comforters are too bulky for this small space and small bed. Again I’d have to store the comforter somewhere during the day as one wouldn’t stay neat on the bed where we sit. And yes, quilts brush off easily, important with the crew jumping up on the bed all the time. Patterns hide dirt until I can get to a laundromat. I also like the cheery atmosphere a bright-colored quilt brings to our living space. I always buy two twin quilts and two shams of the same pattern. A quilt folded in half goes under us, tucked around the cushion, and a quilt folded in half goes over us. Warm enough! Bridget is the one that keeps us warm. She stores a lot of heat! Spike, not so much. You remind me to check about the possibility of lightning. I hadn’t even thought about that. There were 2 or 3 really loud thunderclaps… so there must have been lightning. One just doesn’t expect thunder and lightning in the winter.